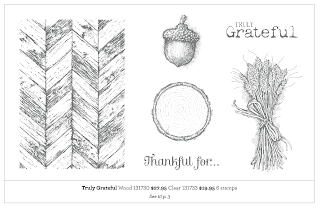 Welcome back to my series of ten precious Stampin' Up Thanksgiving projects to wow amaze you. 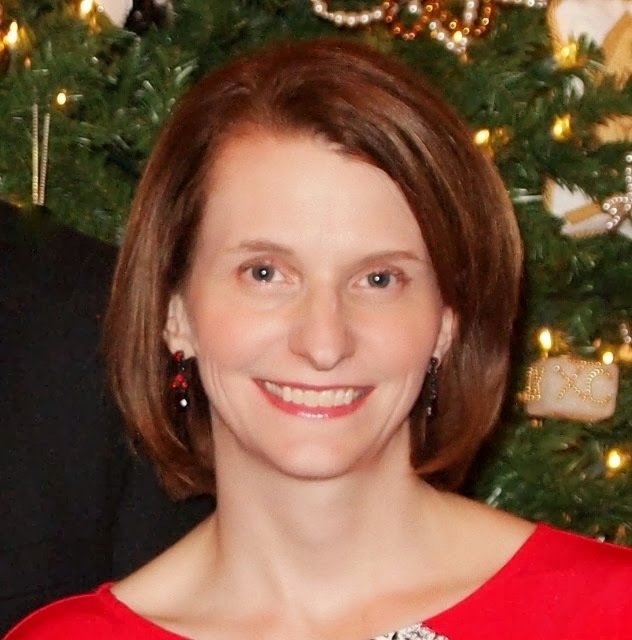 If you missed the first project, click here: 5 Thankful Days Project #1. I will post two projects a day for 5 days so that when you love them and want to make them, you will have plenty of time to make yours before the turkey comes to town! SUBSCRIBE TO MY BLOG DURING THIS SERIES AND I WILL EMAIL YOU A PDF WITH INSTRUCTIONS FROM ALL OF THE PROJECTS LISTED HERE!!! 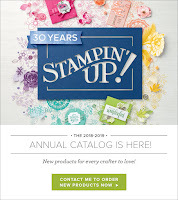 This SIMPLE card I copied straight out of the Stampin' Up holiday catalog. In fact, it's why I bought this set called Truly Grateful. paper: 8 1/2" x 11" whisper white, soft sky card stock, sweather weather designer series paper. THIS IS A VERY SIMPLE CARD!!! Cut whisper white card stock at 5 1/2" x 4 1/4", fold in half for base. Stamp background x2 with crushed curry ink (stacking one over the other). Stamp wheat bunch in early espresso, stamp slotchy splatters with pumpkin pie (Gorgeous Grunge stamp set). 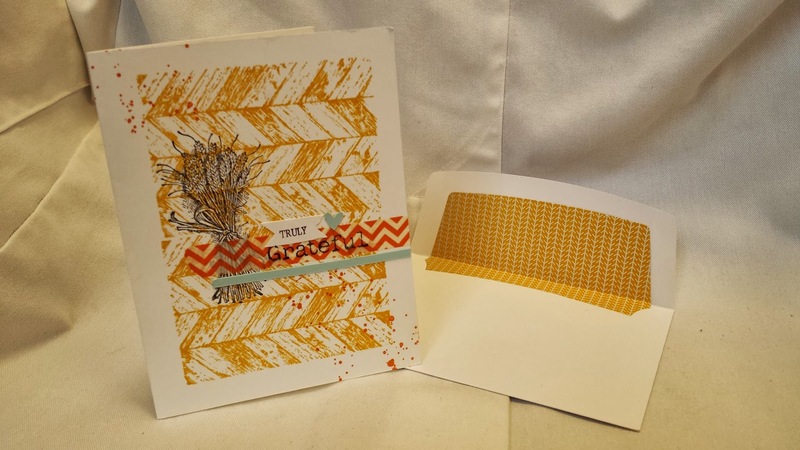 Tear and adhere washi tape across card. 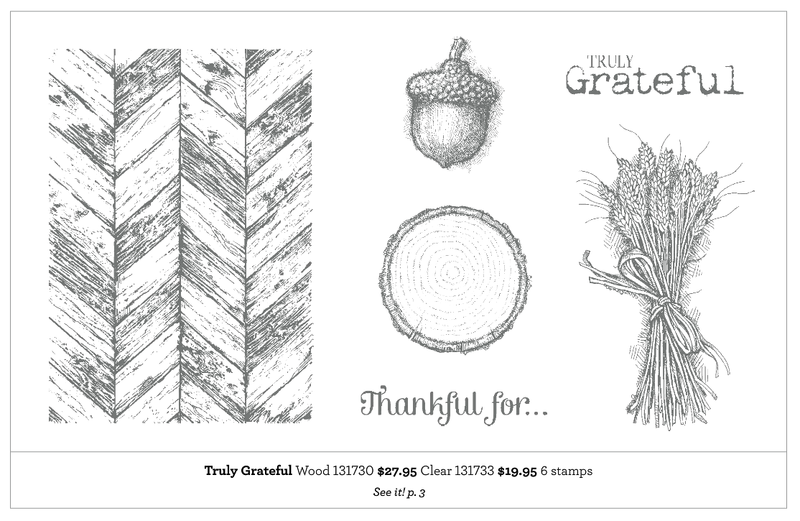 Stamp "truly grateful" with basic black ink. (careful to le tthis dry before touching it. Our basic black is a permanent ink, other classic ink pads would just rub off the washi tape, but the basic black ink will dry permanent. Cut a tiny strip of soft sky and adhere with snail adhesive. Punch a tiny heart of soft sky paper with owl punch and either glue dot or snail adhesive it to the card. Cut envelope liner on Big Shot using the envelope liner die. You are done! EASY! DON'T miss project #3 tomorrow! 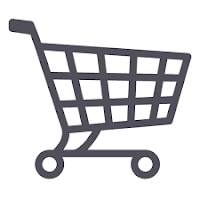 Subscribe to my blog so you won't miss a thing! www.papermadeprettier.com.